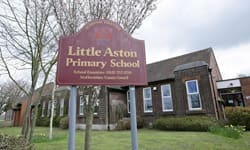 Little Aston Primary School near Sutton Coldfield caters for children aged 3 to 11. The school actively seeks to achieve the highest standards in everything so its pupils can achieve their full potential. The team at Little Aston School knew its CCTV coverage needed to be updated and improved. The school had a CCTV camera system but, as Noreen Brain, Little Aston’s School Business Manager, explained: “It was outdated, not all cameras were working and we had insufficient coverage.” Staff were also particularly concerned about the school’s car park area: several incidents had occurred there but because it wasn’t monitored little could be done. Ecl-ips’s proposal involved upgrading Little Aston’s CCTV coverage from analogue to High Resolution IP, which would give the school much better quality of images and a system that would be extremely easy to navigate and retrieve images from. To solve the problem of the lack of coverage in the car park, Ecl-ips also advised extending CCTV coverage so that all areas, internally and externally, would be covered. Ecl-ips recommended industry-leading HD network video management software, hardware and HD cameras from Avigilon. Avigilon uses open components, so the system is extremely flexible and cost effective, perfect for a school setting. Little Aston now also have everything backed up by an Uninterruptible Power Supply System to guarantee coverage even during a power-cut. Ecl-ips installed 9 cameras to provide complete coverage inside and outside the school. Ecl-ips also used self-learning analytics in the car park cameras to make it easier for the school to identify suspicious people or vehicles if any incidents occur in the future. All of the external cameras fitted have adaptive infra-red emitters so the school has complete coverage day and night and offer HD detail for exceptional image quality. They are also vandal resistant to ensure maximum security. The team at Little Aston are very pleased with the new cameras. Noreen said: “We can now monitor so much more than we could before and we can focus the cameras much more effectively.” The cameras mean the school can retrieve footage far more quickly than before and store footage for much longer. Most importantly, they have got much greater coverage, which means the staff, pupils and property are much safer.